Apparently Hal Jordan has a snack cake made in honor of him. I have no idea if "Glo Balls" existed before, or if this is something completely new. I tend to walk past the Hostess aisle of the grocery store and make a beeline for the Oreos and Pepperidge Farms instead, but now I'm going to keep an eye out for this. Pic shamelessly stolen from here. Do they glow in the dark? Do they disintegrate if you put them too close to a bottle of mustard? Is Hal Jordan's costume really made of sparkly coconut sugar? You be the judge. If you look in the background, you can see "Flash Cakes," which sounds a lot classier. Why, only the most callow, impressionable and naive person would eat a food product with no nutritional value simply because one of their favourite superheroes is on the package. Therefore, all I have to say to that is...gimme gimme gimme!!! LOL. Don't forget to buy some Flash Cakes, too!! 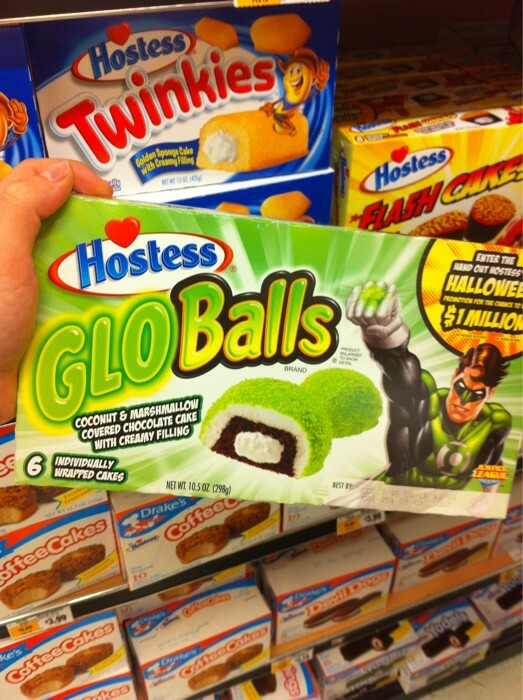 Frank should do a Matter Eater Lad writeup of these Glo Balls on DC Bloodlines. He'd have a field day with it. Does this mean that if a GL gets hungry, he can eat part of his costume/constructs? Well...Hal's handle as a pilot is High Ball. Clearly, Hal just loves himself some balls. That said, I MUST have some. Eyz, now I will forever think of GL constructs as made of coconut sugar. Yum? Oh, Sally. I just nearly died laughing at your comment!